The Core Group is made up of binners from Vancouver. They carry out key contact and outreach tasks within the larger community and make strategic decisions on the direction of the Binners' Project. Find out more. The Steering Committee provides oversight and direction to the overall progress of the Binners' Project. Find out more. 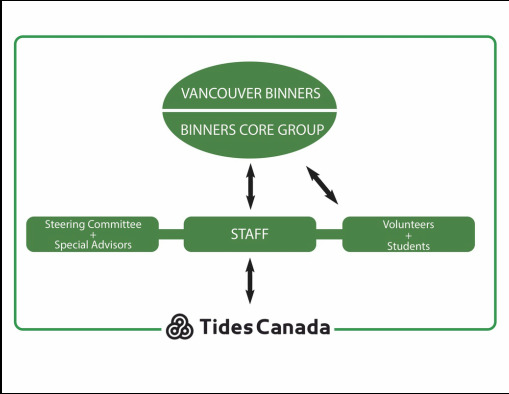 The Binners' Project is made up of four support staff in Vancouver, including two binners. They orchestrate the key administrative, community outreach, fundraising, and operation tasks, as well as develop new initiatives for the project. Find out more. Students, interns and volunteers provide supports in numerous areas of the Binners' Project. Find out more. Interested in volunteering? Contact us.